Foudres line the walls in the recently renovated cellar at Domaine Tempier. Daniel Ravier is a Bandol lifer. Just 48, Ravier earned his chops over 10 plus vintages at two other Bandol estates before joining Domaine Tempier in 2000. Since then he's stewarded this historic property—arguably the appellation's flagship estate—to new heights. Perhaps Ravier's biggest changes at Tempier occurred in the cellar, where old foudres (large wooden casks used for aging wines) were either cleaned or replaced after 2001 and then the oldest part of the winery was renovated with new cement vats added in 2007 for fermentation. Prior to '07, all reds had been fermented in stainless steel, which Ravier was initially opposed to. "But Jérôme Bressy (of Domaine Gourt de Mautens) showed me I was wrong," said Ravier with a smile. "So we do the reds in half cement and half stainless now." For me, the most dramatic changes in the wines here occurred with the 2004 and 2005 vintages, which blazed with a newfound purity, showcasing vivid, nearly electric notes of cassis-soaked rosemary sprigs and minerality. 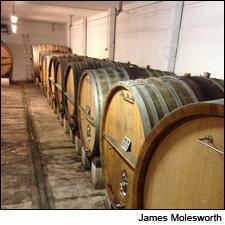 "The cellar," said Ravier plainly when I asked him what kick-started the new profile. "The vineyards have always been what they are, but cleaning the cellars was certainly a change." Ravier is tweaking the vineyards a bit too though, as he has just started working biodynamically (he always worked organically before). "Organics is a minimum," he said flatly. "We have to respect the terroir and give back to it. And I also don't want people here working with or near chemicals. But the main thing for me is that biodynamics is something I hope can help us take the next step to making even better wine." "We're facing dramatic climate change," continued Ravier. "I've been in Bandol since 1987 and we used to harvest only after Sept. 15. But since '00 I've only had two vintages that started in September—all the others have started in August. So having healthy vineyards is going to be critical for the future." The 2013 Bandol Rosé combines lots that are both direct press and 24 hours of skin contact with a drop of saignéed juice (bled off of fermenting red wine vats). It shows piercing peach, rose water, white raspberry and iron notes that should stretch out with a bit of time in bottle. Ravier agreed, noting he'd rather drink his 2012 rosé now, as he likes to give it a year in bottle. "But everyone drinks the rosé so fast. It's gone from the cellar before spring when I would rather hold it back a bit." The 2013 Bandol White, produced from Clairette, Ugni Blanc, Bourboulenc, Marsanne and Rolle, offers a lightly waxy feel, with enticing acacia, heather and verbena notes. Its softer texture was likely from extra air, as the sample that was poured had been opened previously. The 2012 Bandol White showed more youthful zest, with honeysuckle, lemon peel, fennel and star fruit notes while showing a decidedly juicier feel through the finish. Of course, those who know Bandol in general and Domaine Tempier in particular, know the domaine for its red wine cuvées. I'll follow up in my next post with notes on the reds from both the 2012 and '13 vintage.